"Come over and let's do a Dream Board!" This simple yet heartfelt invitation is what changed my life. You see, during my mid-twenties, the life I had dreamed of and built up to had completely fallen apart. Yet, it lead me towards discovering my purpose and living a more empowering life. At the age of 25, a huge shift took place as I was going through a divorce, said goodbye to our dogs, our cars, our home and my business. Surfing was put on hold. Anything that I loved to do was dropped (except for my weight), because I didn't feel like myself anymore. Within six months of the divorce, I had gained 30 lbs. When I did surf, I made sure to wear a shirt over my swimsuit because, I did not want to be seen in my bikini. I didn't look like myself. I didn't feel like myself. I didn't know who I was and I felt stuck and totally alone. During this time, a friend of mine, Noelani, invited me to join her and another friend to create a Dreamboard. Some of you may know it as a “vision board” from the book “The Secret.” I took her up on her invitation because doing a manifesting project sounded like a fun thing to do. And I was curious after she urged me to do this with her because she felt we both needed it, especially since we were going through very similar situations in our lives. "Look for images in these magazines that you want to attract in your life. Cut them out and glue them onto this paper." were Noelani's simple directions. The evening started off with excitement being that I'm spending time with my girls. Shortly after there was a sense of peace as the room turned silent. It was as if we were in a meditative flow. Some time during that moment of silence, a sense of liberation took over my body, because I realized that at this very moment, I was fully in charge of my future, of my reality! This was huge for me, because after all these years, I had built up this limited belief that I needed to ask for permission in order to make big choices in my life, even if I believed it would bring me happiness. This realization brought me a sense of empowerment and I was determined to finish this thing. I found myself in a trance as I spent hours flipping through the pages of magazines, searching for images. About three hours into it, I looked up and realized that I was surrounded by hundreds of images and there was no way that they would all fit on that tiny 8" x 10" sheet of paper. A large cardboard diaper box was the biggest thing I could find in the house that would make for the perfect foundation for my vision board. But, even then, there was no way all of the images I had cut out were going to fit. I went from having zero ambitions to having an overwhelming load of aspirations. So, naturally, being the organized freak that I am, I started to categorize and prioritize all of what I wanted to attract in my life that would fit on the board. I chose to only add the images that I had the strongest desire for. This was the beginning of how I began creating my own personalized style of vision boarding. I worked on my dream board up till the break of dawn, a total of eight hours! You must be wondering, why in the world anyone would spend so much time making a "collage?" Well, I can explain...You see, something magical happened during those eight hours. I gained a sense of clarity, liberation, and inner strength. I was designing my future and the person I wanted to be. This fueled me and kept me focused until my dream board was completely full. And to my surprise, no more than two and a half weeks later, a number of my major dreams actually manifested. With every dream that came to fruit, my confidence and my believability level instantly heightened. I became a stronger manifestor and a more conscious, decisive, decision maker, because I would attract opportunities that continued to be in total alignment with what I had placed on my vision board. I was hooked on manifesting and had so much fun with this new way of living. That night, a seed was planted that would eventually lead me towards creating a more loving and healthier relationship with myself, attracting a happy relationship with the man of my dreams, and discovering my unique gifts and life's purpose. So, what lead me to turning this discovery into a business? One afternoon, I met up with one of my close girl friends. She voiced to me that she was feeling stuck and going through hardship in her relationship and career. I couldn't bare to see her suffer any longer and so the idea of sharing with her what was helping my life popped up. And I extended that same invitation that Noelani had given to me months before, "Come over and let's do a Dreamboard!" I dragged my friend over to my house and went straight to working on her Dreamboard. About three solid hours went by and I had watched my friend go from feeling overwhelmed with despair to feeling empowered and motivated towards making big changes in her life. Through getting clarity on her new life desires, she eventually built up the courage to leave the industry she had known so well to venture into an industry that was fairly new to her, yet more in alignment with what she had placed on her Dreamboard. From that afternoon, her entire world began to change. And I am proud to share with you that seven years later, she has gone through a huge transformation. She chose a path to wellness and to pay it forward by making the most of her gifts through being of service to people who are in need. And through this philosophy, her yoga business she started continues to thrive. It brought me so much joy to see her growth since our very first session. Since that day, we’ve continued our sessions, updating both her Life Board and Business Board yearly. After our first session, I continued to help other close friends in the same way. I enjoyed watching their growth as well as receiving their feedback on my style of Dreamboarding. In time, one of them asked me to consider holding a workshop to share this special tool with more people who need clarity in their lives, too. And so, one day, everything fell into place and I just made one up! After sharing my workshop idea with a friend, who happened to be the owner of Fresh Cafe, an artsy and hip venue in Honolulu, she graciously offered the space to me. I took that as a sign and decided to go all out and created my very first workshop. I started off inviting everyone I could think of that would be open to this idea of a Dreamboard Workshop. Excited and nervous, I wasn’t sure what people would think or if they would even show up. So, my first round of workshops were free of charge! I funded it all, as I was curious to see the possibilities of what this work would do for others. I remember how full my heart felt during and after my first workshop. Watching people light up and hearing them express how they went from feeling stuck to feeling liberated, reinspired and motivated in my class, felt so good. People were recognizing the value in my style of guidance. Soon after, I would receive surprise texts, emails and phone calls with manifesting shares. “I attracted my dream job!” “I met the woman of my dreams!” “I’m pregnant!” “I received a huge promotion!” I light up and get inspired from their wins. I can’t help but smile real big and feel energized. Manifesting shares are still my favorite part about the work that I do. After they continued to encourage me to keep teaching this method I decided to create a business out of it! I eventually began, collaborating with other mindful coaches and businesses. And expanded out to holding workshops, seminars, and retreats on the outer islands, California, Las Vegas and Japan. (Japan being one of the images I had glued on my very first dream board, because I love Japan!) As my business grew, I made a commitment to continue working on my own personal growth, where I discovered unique and powerful tools that I’ve mindfully adopted and merged into my style of Dreamboarding and coaching including, Feng Shui, guided visualizations, intentional writing exercises, NLP, and meditation. If you'd like to get clear in your life, I created the "Life Board," where we focus on nine core areas of your life. And if you are looking to create or refresh the foundation of your own business, I created the "Business Board," using the same foundation of the Life Board, but focusing on a different set core categories. These boards are a visual representation of a blend of your conscious and subconscious thoughts, strategically placed to help to create more harmony in your life, keeping you focused and on track. It’s your mindful accountability partner. A tool I passionately share with friends, leaders, teams, entrepreneurs, mothers, fathers, teachers, healers, teenagers, and children. I am currently building a team of dreamers, who are eager to help people like you, across the globe, to get clear, discover your purpose in life, design the life you choose to live, and have the courage to turn your dreams into reality. All it takes is having an open mind and making a commitment to investing in your own self growth. You see, my dream is to be a contributor of universal happiness through doing what I know best, which I’ve discovered on my own path towards self growth, thanks to my Dreamboard. And with gratitude, my heart continues to pay it forward, as I extend the invitation to you, "Come over and let's do a Dreamboard." Are you anxious to start, but need help figuring out where to begin? Sign up for a no obligation, 30 minute, complimentary consultation with Dream Coach, Tiare Thomas. Share what is weighing on your mind and Tiare will be happy to propose a mindfully curated plan for you to get started towards achieving your goals and dreams. TIARE THOMAS is a Life Design Coach who knows how to create clarity, attract true abundance in your life, and generate the courage to turn your wildest dreams into reality. 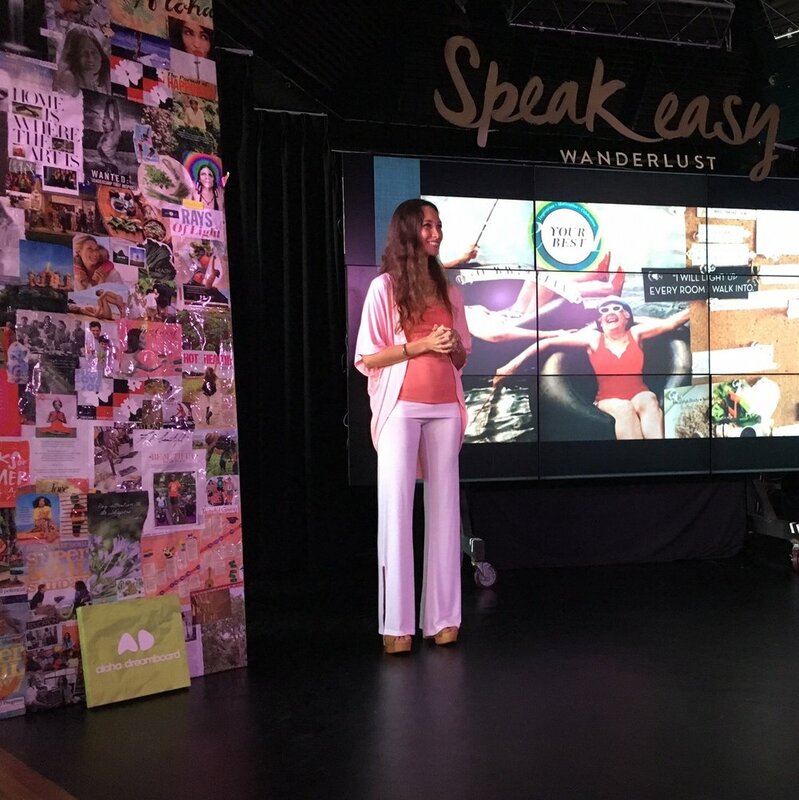 Her greatest passion is the work she does as the founder of Aloha Dreamboard, the personal and business development company she created in 2009. Tiare has a unique style in guiding you to intentionally create your dream life, relationship and business in order to bring your deepest desires into fruition. She coaches you by using the Art of Dream Boarding, Feng Shui, and a variety of strategic techniques in an intuitive way to define and align your core values with your goals and dreams. Tiare has helped clients to define and manifest their dream job, dream partner, dream home. And her clients have shown her again and again - if you can dream it you can attract it. As your dream guide, Tiare embodies the spirit of Aloha in her compassionate understanding, and in her creative ability to help you tap into your inner wisdom. Through her coaching process she provides wonderful tools to help you map out and stay accountable to your personal visions. Tiare has purposefully manifested opportunities that have influenced her impact as a coach and personal life in fantastic ways, like becoming a model, fashion stylist, and professional surfer, as well as attracting the man of her dreams. For more than a decade Tiare has lead educators, leaders, athletes, families, and entrepreneurs in the wellness and fashion industries to define their own success, achieve it. Erik Harris has been in the service industry for 11 years, and has worked his way up to head bartender and trainer for a $12 million a year restaurant in beautiful Waikiki. He has been with Aloha Dreamboard since 2014. Erik's expression for dreamboarding is "Cosmic Cataloging." His goal is to support more men in sharing Aloha Dreamboard's strategies to build their own personal vision for their lives. Erik has been a member of the South Coast Aikido Society since age 5, and is a 1st degree black belt and instructor. He blends his martial arts, service industry and sports background to lead people to their passion and purpose in life. You can find him at the park, at the beach, at the gym, playing basketball, or spending time with his lovely and beautiful wife, Tiare Thomas Harris and their french bulldog, Whiskey. Kamalei Grace is a certified Life Design Coach that specializes in designing a life that is exciting to live, custom to each individual. She practices a holistic approach in helping these individuals achieve their desired lifestyle. When Kamalei isn’t coaching, she creatively incorporates design through both fashion and graphic art. Her creative style has led her to work with various mediums, such as ad campaigns, magazines, fashion shows, and film. Her recent work has been featured in R Magazine and the Hawaii International Film Festival nominee, Lahaina Noon. Embodying the idea of living life by design, Kamalei is a self-taught graphic designer - her proudest accomplishment to date. As a native Hawaiian, she embodies the aloha spirit and carries that positive energy wherever the universe takes her. Living her dream of designing her way through life has become her biggest inspiration for helping others. Kamalei enjoys living a variant and vibrant life. She has a love for creative hobbies, like infusing essential oil blends, film photography, and yoga. Kecia Littman is a creator of beauty. Whether in song, dance or makeup artistry, she wills her way to the heart of the matter. Manifesting inner beauty into reality as a professional Makeup Artist, for the past 16 years, Kecia has drawn inspiration from the serene island spirit of Hawai’i. Kecia began her journey as a makeup artist with MAC Cosmetics. Soon after, she evolved to lead her team in a managing position at the MAC Cosmetics store in Ala Moana, Hawaii. Her desire for success led her to pursue a license as an Esthetician and eventually she rose to become a licensed Esthetics Instructor in the state of Hawaii. Kecia rapidly applied her expertise by joining forces with accredited professional school, Makeup Designory (MUD), to produce one of the most comprehensive makeup curriculums Honolulu has ever seen. While maintaining a freelance career, Kecia never swayed from her primary intention to support beauty enthusiasts through example. Fixated on trending fashion, cosmetics, and high definition technology, Kecia began to train alongside Roque Cozzette, airbrush makeup aficionado and creator of internationally known Cozzette’s vegan brush and makeup line. This training enabled her to become proficient in airbrush artistry, and elevated her skills to accommodate the growing needs of her multi-faceted clientele. This wave of ambition has expanded her horizons from Hawaii, where she currently resides, to the runways of New York fashion week, where she assisted creative design director of Proctor & Gamble, Pat McGrath. Motivated by haute couture, fashion trends, art, and beauty, she endlessly aspires to lift the vibration of Hawaii by producing gorgeous images for publications such as HI Luxury magazine, Honolulu Magazine, Martha Stewart Weddings, and Four Seasons Magazine, to name a few. Some of her celebrity clients include Mariska Hargitay, Kimora Lee Simmons, Pierce Brosnan, and Taryn Manning. Kecia has recently acquired a Life/ motivational coaching certification from Global NLP Institute and is fusing this with her makeup career in order to educate and guide others towards reaching inner and outer beauty. Kecia’s generous spirit, consummate enthusiasm and appreciation for life are evident as she exemplifies creativity, using makeup as her muse. Angela Maki Vernon is a professional surfer, TV personality and model. Angela’s beautiful smile and energy shines as bright as Hawai‘i's radiant sun. You may see Angela’s beautiful smile gracing the covers of a number of Hawai‘i themed magazines. Amongst Angela’s many endeavors, she is also the founder of a non-profit organization called “Ocean's Love”. Ocean’s Love is a surfing school in Japan for disabled children. Angela loves to help people feel calm, happy and re-energized. She was inspired by the powerful healing elements of the ocean to create an opportunity for disabled children. And she believed the surf would give the children of Ocean’s Love these gifts. Ocean’s Love also gives these children the opportunity to enjoy the ocean, as well as brings more awareness and understanding of children with disabilities throughout the country. Angela believes in including a balance of mind, body, and spiritual health conscious practices to maintain a healthy and happy lifestyle. The health benefits of yoga and it’s philosophy encouraged Angela to become a yoga teacher. Angela currently teaches yoga workshops in Japan and Surf & Yoga Retreats here in Honolulu, Hawai‘i. Click here to see her life style blog. Salina Storozuk began her meditation and yoga practice 15 years ago in India where she embarked on a lifelong spiritual journey. In 2013 she studied at the Maya Yoga Studio on Maui and became a Registered Yoga Teacher (RYT-200). She loves the combination of yoga and meditation in her life and enjoys sharing these practices. Currently Salina practices Mysore Ashtanga yoga daily at Purple Yoga studio. At home she does insight, zen or simple silent meditation. Throughout the year she attends silent meditation retreats when she can. Salina is the owner of Flo Yoga Hawaii LLC and teaches Ashtanga yoga, yin yoga, yoga nidra, meditation and outdoor hatha and sunset yoga classes in Honolulu, Hawaii. She is also a Stress Management Specialist at the Ekahi Ornish Heart Disease Reversal Program. When not yoga-ing Salina loves to surf, be in nature, travel the world, spend quality time with friends and learn from inspiring books and films. Daniela Voicescu was born in Bucharest to a Romanian family, the youngest daughter of two civil engineers. She spent her early years in the sleepy mountain town of Busteni, raising chickens and picking mushrooms in the forest. After the end of communism, Daniela and her family emigrated to Belgium, just south of Brussels. It was there that she began her career in modeling, winning the “Best Model of Belgium” competition at the age of 17. Her early success encouraged her to move to Paris, where she lived and worked for 5 years. During that time she was featured in several national advertising campaigns in Belgium and France. She also worked in Athens, Zurich, Ibiza, Cologne, Luxembourg, Rotterdam, Cannes, and numerous other cities in Europe. In 2005, bored with the Continent, she struck out for the Far East and landed in Beijing. While she continued to model throughout China, she also started her own business, the eponymous Daniela V. beauty salon. Beijing is where she met her American fiancee, with whom she would move to Hawaii several years later. Throughout her career as a model, Daniela had the opportunity to work with many of the top photographers in the industry. It was a blessing, but it also gave her outsized expectations for the quality and talent needed to succeed. Since embarking on her photography career, she has had the opportunity to work with local and international models and celebrities, and her work has been published in Disfunkshion Magazine, Flux Magazine, Waikiki Magazine, Hi Modern Luxury and Hawaii Modern Luxury. She has also won awards for her photography, recently landing 2nd place in the Just Proud International Photography contest. As a photographer her vision has been heavily influenced by her international background. Assimilating themes from the calculated chic of Paris to the overfed smorgasbord of Chinese fashion, Daniela’s work is visually arresting, framing women in the context of the hunter-gatherer, Cleopatra, and Athena archetypes. Leslie Schipper is a free-spirited wanderlusting yogini with ambitions to inspire, give thanks perpetually, and spread aloha wherever her feet find her. Happiest in the outdoors, she prefers to spend her time hiking mountain ranges in search of epic views, taking road trips in Buttercup (her 1979 VW bus), and documenting the wild ride with a camera and journal always nearby. Her writings are heavily influenced by her love for travel, yoga practice, worship of nature, spiritual curiosity, and dedication to holistic health & wellness. Kara Fujita Jovic has spent the past 12 years working in international brand strategy and design for Fortune 500 companies across Europe, Asia and North America. Leading accounts and 360-degree campaigns across touch points - packaging, advertising, digital & social media, experiential and PR. Her background also includes editorial and management work in magazines, book publishing and advertising, Having studied fashion design and literature, she's passionate about the power of design and verbal expression to create meaningful and powerful dialogue. Fluent in English and French, she's at ease working in both languages. Kara believes in the power of the breath to center the soul…that love is a super power—for it always speaks the loudest…and that dancing in the kitchen while singing Bob Marley’s “Three Little Birds” may just infuse a meal with magical powers. When she’s not getting caffeinated on fresh air, sunshine, or the sea, you can find her creating, exploring, writing, and helping people find their own personal om. Jessica Ando, M.A. is a passionate artist and creates her art from a place of authenticity, trust, and flow. She strongly believes that art and creativity has taught her so much about herself and how to have a positive approach to life. She obtained her Master’s Degree in Marital and Family Therapy and Art Therapy from Loyola Marymount University in Los Angeles, CA. She currently works as a grief counselor and art therapist for the past 6 years and enjoys utilizing art with clients as a way to help them express and heal. In 2014 she also decided to commit to becoming an artist and started her art business Blissography, which was something she always had on her list of dreams since she was a child. She began to paint and create designs on river rocks as well creating drawings and watercolor paintings. All her artwork is inspired by the blissful feeling we experience when we are in alignment and flow with our highest and truest self. She hopes her artwork inspires people to connect to the bliss and magic in themselves and all around them. Jessica has shown and sold her art at craft fairs and at the Haleiwa Arts Festival. She also is honored to have had many wonderful opportunities to work with other passionate individuals and businesses, such as Aloha Dreamboard, to further stretch the capacity of what art, creativity, and collaboration can bring to the community. Jessica also enjoys playing the guitar, singing, and is currently learning horseback riding! She is most focused on living her truth and allowing herself to be wild, free, and full of joy! Click here to see her artwork. Michael Keany is a magazine editor and writer, covering stories about Hawai‘i since 2004. He grew up on the east side of Maui, graduated from the University of Hawai‘i at Mānoa with a degree in journalism, and generally digs everything about the English language and the Islands. In his free time, he shoots photos, rides bikes, tackles trails with killer views and watches reruns of Adventure Time. Click here to see more of his photography. Nikki Nguyen is currently a student at Chapman University in Orange, California. She is pursuing a degree in Business Administration with an emphasis in Marketing as the next step towards her career goal of becoming a fashion buyer. The power of dreaming mixed with a go-getting attitude has allowed her to produce her own fashion show, work in retail, study fashion business in New York, and hold numerous internship positions since her sophomore year of high-school. Born and raised in Honolulu, Nikki never forgets to apply a friendly and loving nature into her lifestyle. Her three favorite words are “vibes,” “idiosyncrasy,” and “soul”. Because Nikki believes that being well-rounded is the key to a fulfilling life, she stays active through her love of basketball and creative through her photography, writing, reading, guitar playing, and social media. Click here to see more of Nikki's work. Lalaine’s personal mission in this world revolves around becoming the voice for various minority groups in the United States and creating a presence for Filipinos in the country. As she makes her presence known in the journalism world, you can read her work here. Mudra Love recently attended Oprah Winfrey’s “Live Your Best Life” tour and is passionate about doing just that. She aims to live every moment with intention and embody the truest expression of herself. High among her priorities are investing in her personal development, which includes: daily meditation, mindfulness practice, reading books to nourish her spirit, writing to heal the soul, and vibrantly Dreamboarding. One of Mudra’s recent manifestations was her big debut, modeling on the New York Fashion Week’s runway for Hawaii culture conscious designer, MANAOLA Hawaii. You can also find her beautiful presence, gracing the cover of magazines and in local, national, and international advertisement campaigns. In addition to maintaining her practice in personal development, Mudra believes in high quality relationships and strives to foster them in her life. Like Oprah — gratitude is her religion and she is thankful for all the wonderful people in her life and continues to live every day with a grateful heart and an abundant spirit. Mudra is currently working on a part-memoir, part-intro to Buddhism for those interested in walking a spiritual path. You can learn more about her upcoming book and visit her blog at www.monksdaughter.com.